Front: Joe Scott, Ashley Hicks Raper, Skylar Mearing, Jessica I. Roberts, Chris Murray. Back: Dean Mac Banks, Tyler E. Freeman, Dr. Nicholas Hester, Adam Tarleton, David Parrish. Not pictured: Rachel Moss Gauldin. 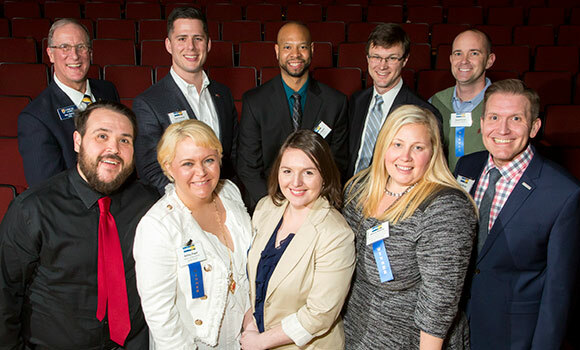 Ten UNCG students and alumni were recognized at the Triad Business Journal’s 40 Under Forty event held at UNCG’s Elliott University Center on Thursday, Feb. 16. Sponsored by the Bryan School of Business and Economics, the annual event honors the top movers and shakers – under the age of 40 – from across the Triad. The 2017 honorees range in age from 26 to 39 and represent a variety of industries. To learn more and to view the full list of honorees, click here. For more information about the Bryan School, visit bryan.uncg.edu.